"I must say, I should hate to think we were sharing our dinner last night with a couple of Nazis..."
Ealing's unofficial propaganda effort Went The Day Well?, directed by Alberto Cavalcanti from 'The Lieutenant Died Last' by Graham Greene, realises the nightmare scenario most feared by wartime Britain, that the Third Reich should successfully infiltrate and invade the jam and Jerusalem idyll of Little England, represented here by the fictitious Buckinghamshire village of Bramley End. As in Orson Welles's The Stranger (1946), the unthinkable happens and a wolfish Nazi in sheep's clothing inveigles his way into the Allies' cherished heartlands, conniving to win the trust of the locals so that he may spread his influence like a vicious contagion. Only in this case, there's a whole regiment of the blighters, aided by treacherous squire Oliver Wilsford (Leslie Banks), a Fifth Columnist invaluable to the German cause. Rather than a full-blown invasion on the scale of Operation Sea Lion, Kommandant Orlter (Basil Sydney) and his men have been ordered to start small, making a stronghold of this proto-Titfield so that their comrades may follow suit. Posing as British soldiers on manoeuvres, the canny Huns make themselves agreeable, organise billets and visit the pub before swiftly turning their guns on the startled locals and rounding them up in the church, curtly interrupting a wedding in the process. Having laid out their microcosmic playing field, Cavalcanti and his writers Angus MacPhail, John Dighton and Diana Morgan then glory in the villagers' heroic fightback, whereupon the film becomes a hymn to community and good old fashioned native British pluck. 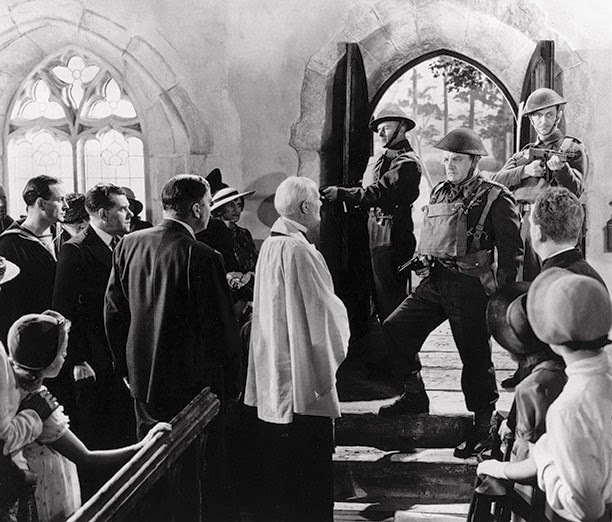 The unflinching violence of the enemy - cruelly dispatching an aged vicar (C.V. France), mowing down the entire Home Guard on a country lane, even shooting studio child star Harry Fowler in the leg - is more than matched by the villagers. A dotty post mistress (Muriel George) serves her captor a hearty supper ("You Germans are partial to sausage, aren't you?") 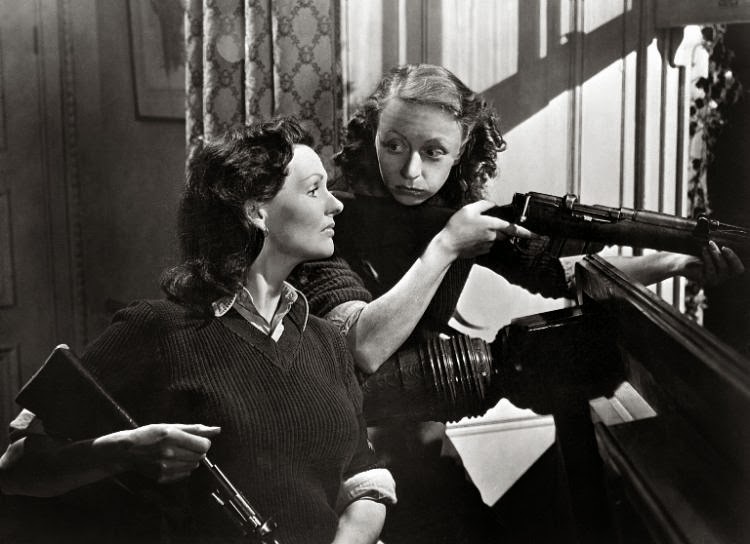 before bludgeoning him to death, the vicar's daughter (Valerie Taylor) blasts Wilsford to Kingdom Come and even Thora Hird's land girl gets behind a machine gun. It's rousing stuff and, at times, very moving, as when the lady of the manor (Marie Lohr) selflessly throws herself upon a grenade to protect a room full of children (one of several good roles for women). Cavalcanti barely conceals his relish for subverting the bucolic rural England of fantasy, as Edgar Wright and Simon Pegg did more recently in Hot Fuzz (2007). The image of a dead Gerry bobbing about in the duck pond neatly encapsulates his theme.